Redstuff ceramic brake pads, passenger car/saloon car pad. Not made for truck or SUV fitments. EBC lowest dust fast street pad with 20-25% brake improvement. 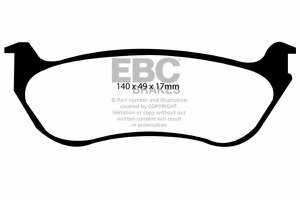 EBC Redstuff ceramic brake pads, passenger car/saloon car pad. Not made for Truck or SUV fitments. Superb material for Prestige imports/European and Asian cars. Available for 99% of vehicles on the road.